Have you ever had a week where you just didn't want to think about what papers to use and how to use them? I'm having one of those weeks. It's not that I'm not inspired, because I am. It's just this has been an emotional week for me and I need to craft, but I also need to leave the thinking to someone else. Yesterday I went of my first ever crop at Paradise Scrapbook Boutique. (check out her blog: http://paradisescrapbookboutique.typepad.com/ ) That sounds odd for someone who has been making cards and scrapbook pages for years. Well, I'm just never organized enough to have a project ready to take out of my craft room and assemble it at a crop. Yesterday was no exception. Carolyn told me that she purchases kits. That's just what I did. 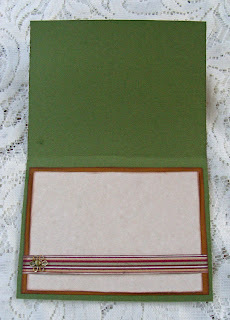 During my crop time, I assembled a scrapbook set of 2 pages. It turned out really, really nice. (Because it's not my creation and I don't have Karen's permission yet...so I won't post it) I also made a card from a kit. As I was leaving, I thought maybe I should purchase another kit and work on it at home. This kit was different than the first two. This kit consisted of papers and embellishments. I had to create whatever layout I wanted. I decided to make a card. Actually, this kit turned out to be pretty cost effective. I think I can get a minimum of 5 cards out of the papers. So... for $6.99 that's a great deal! I got up early this morning (the dogs find it necessary to get up at 5:00 AM to bark at whatever is going bump in the dark...usually a raccoon. I decided to get started on a card. I used Mojo Monday's Week 94 Sketch. There I go, not thinking again....I'm beginning to like this! I used the Cuttlebug Tiny Bubbles for the background on the brown paper. 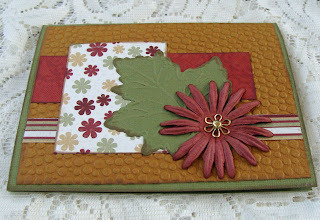 I also used the Cuttlebug Maple Leaf. 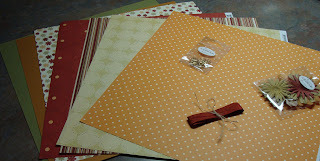 The papers and embellishments all came from a kit Karen put together. Notice, there is no sentiment! Sometimes it's nice to have a card you can use for what ever you'd like. This is one of those cards. I can always add a sentiment later...or just write a quick note inside. I guess to make a long blog short.....Let Someone Else Do The Thinking. I can't say I'll do it all the time, but for those times that you want to make a card or a scrapbook page...turn the thinking over to someone else. You are still adding your creative mind to the finished project. I'm off to Weight Watchers....I'm feeling good about my progress in the weight area. Have a wonderful week! You are quite the blogger these days, I love your projects! Yes, you can post anything you make at PSB.